Sorry…but the Harvard Library got all the old manuscripts I had about eight years ago! 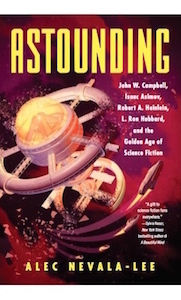 Since I stopped writing stories when I became editor of Astounding/Analog, I haven’t produced any manuscripts since 1938…So…sorry, but any scholarly would-be biographers are going to have a tough time finding any useful documentation on me! I just didn’t keep the records! When I sat down to read these pages, I was mostly just hoping to get some insight into the writing of “Who Goes There?”, which has been rightly ranked as the greatest science fiction suspense story of all time. But what I found there was so remarkable that I still can’t quite believe it myself. “Who Goes There?” is famously about an Antarctic research expedition that stumbles across a hideous extraterrestrial buried in the ice, and as it originally appeared in Astounding Science Fiction in 1938, the novella opens with the alien’s body already back at the base, with everything that happened beforehand—the magnetic anomaly that led the team to the site, the uncovering of the spaceship, and its accidental destruction—recounted in dialogue. In the draft of “Frozen Hell” that was preserved in Campbell’s papers, it’s narrated in detail from the beginning, with a huge forty-five page opening section, never before published, about the discovery of the spacecraft itself. (Apart from a few plot points and character names, the rest tracks the established version fairly closely, although there are some interesting surprises and variations.) We know that Campbell discussed the story with the editors F. Orlin Tremaine and Frank Blackwell, and at some point, they evidently decided that most of this material should be cut or integrated elsewhere. Judging from the other manuscripts that I found at Harvard, Campbell often cut the beginnings from his stories, which reflected the advice that he later gave to other writers, including Isaac Asimov, that you should enter the story as late as possible. But when you restore this material, which is written on the same high level as the rest, you end up with something fascinating—a story that shifts abruptly from straight adventure into horror. This is the kind of structure that I love, and there’s something very modern about the way in which it switches genres halfway through. The result amounted to an entirely different version, and a completely worthwhile one, of one of the most famous science fiction stories ever written, which had been waiting there at Harvard all this time. As far as I can tell, no one else ever knew that it existed, and the more I thought about its potential, the more excited I became. I began by reaching out to Campbell’s daughter Leslyn, whom I had gotten to know through working on his biography, and she referred me in turn to John Gregory Betancourt, the writer and editor who manages the estate. John agreed that it was worth publishing, and he ultimately decided to release it through his own imprint, Wildside Press, in a special edition funded through a campaign on Kickstarter. The result went live last week, with a goal of raising $1,000, and it quickly blew past everyone’s expectations. As I type this, its pledges have exceeded $27,000, and it shows no sign of stopping. (Andrew Liptak of The Verge had a nice writeup about the project, which seems to have helped, and word of mouth is still spreading.) At the moment, the package will include an introduction by Robert Silverberg, original fiction by Betancourt and G.D. Falksen, and cover and interior illustrations by Bob Eggleton, with more features to follow as it reaches its stretch goals. I’ll be contributing a preface in which I’ll talk more about the manuscript, Campbell’s writing process, and some of the variant openings that were also preserved in his papers. Publication is scheduled for early next year, and I’m hoping to have more updates soon—although I’m already thrilled beyond measure by the response so far. Astounding comes out tomorrow, and I’m obviously curious about what its reception will be. There are some big developments just around the corner. But I wouldn’t be surprised if Frozen Hell ends up being the best thing to come out of this entire project. We are to go shopping buying some clothes for me to wear on Earth, it seems to me this is carrying realism too far but I do not want any more time in the hotel with nothing to do…M’Clare is all the time trying to get me to talk, he says for instance Have I ever thought about going to College? I say Sure, I count my blessings now and then. I’m taking “Unwillingly to School”; it’s completely delightful and completely unique. On this one, I really feel you should use your own feminine name; only a woman could have achieved that precise presentation of a girl’s enthusiastic, bubbling-with-life, confused, yet strongly directed thinking…I hope you’ll be able to make the London Science Fiction Convention this September; I’ll be there, and I’d enjoy meeting you. The lead novelette will be “Unwillingly to School,” by Pauline Ashwell. She is genuinely, no-kidding, a new author, not an old one in a new disguise. There has never been a science-fiction story like this before; I am hopefully praying, however, that Miss Ashwell can repeat and extend the adventures of Lizzie Lee, who must be read to be believed. Lizzie is a teenage girl that I am extremely glad I never met, and delighted to have read about; she’s a menace, and in the course of “Unwillingly to School” she breaks every rule of English grammar, punctuation, and composition I ever heard about, and I think invents a few in order to rebel against them, too. Lizzie is this year’s Christmas present to the readers, from Astounding Science Fiction. The last yarn we ran which had a teenage girl as the central character was “Unwillingly To School”; it was written by an expert on teenage girls (she had been one; she taught at a girl’s school; she was a biologist-anthropologist—and she could write and had a magnificent sense of humor). It didn’t go over so hot—our readers appear to be less than enthusiastic about the peculiarities of teenage girl’s thinking. That seems to be a reasonable attitude; teenage girls don’t like teenage girls’ thinking either—including their own. They’re inherently frustrated, squeezed thereby into an inferiority complex type of apparent self-satisfaction, are immensely erratic, and utterly undependable. It’s a shame, because Lizzie was, frankly, a more interesting character than Poddy, and while Ashwell later wrote two more installments in the series in the eighties, which I haven’t read, it would have been nice to see more of her in the sixties. And the episode gets at something important about Campbell. As an editor, he never had much of an interest in diversifying his writers or characters, at least when it came to race, but he would have been happy to have had more women. His readers, who were overwhelmingly male, weren’t particularly interested, and when such efforts as “Unwillingly to School” failed to make an impression, he dropped it. On some level, this reflects the role that he claimed to see for himself, writing decades earlier: “A magazine is not an autocracy, as readers tend to believe, ruled arbitrarily by an editor’s opinions. It is a democracy by readers’ votes, the editor serving as election board official. The authors are the candidates, their style and stories the platform.” And there’s no question that he listened seriously to feedback from his readers as a whole. On another level, though, it only tells us which battles he was willing to fight. Campbell was more than glad to take on issues that he thought were important, like psionics, and persistently force them onto his audience in the absence of any conceivable demand. He could have chosen to invest the same energy into issues of representation, which could only have elevated the quality of the fiction that he was publishing, but when the readers pushed back, he didn’t press it. That’s more revealing than anything else, and it represents a real loss. Campbell published important work by such authors as Leigh Brackett, Catherine L. Moore, Judith Merril, and Anne McCaffrey, but the magazine mostly lacked straightforward stories like “The Lost Kafoozalum,” in which women appeared without comment as the heroes of the stock gadget and engineering stories that filled the pages of Astounding and Analog. As a result, the migration of women into hard science fiction never really took place, at least not under Campbell’s watch. He wanted it to happen. But not quite badly enough. It was all much simpler long ago, in the old days when I was a high-volume producer of fiction…Getting ideas was no problem; they arrived mysteriously out of the air, like radio broadcasts, while I was reading or strolling or listening to music. I jotted them down on handy scraps of paper—often nothing but a title (titles usually came before plots for me, and still do) and a brief summary of theme…The morning I was due to begin work on a story, I would elaborate the summary into a two-paragraph outline, pick some characters, give them their names and physical descriptions, and start work…My years as a high-volume producer had given me skills of expression and improvisation that allowed me to say what I wanted to say clearly and effectively in a single try. What I wanted to say, though, became ever more complex and difficult to express, and during the late sixties my working methods evolved toward what they are today, so very different from my habits of fifteen years ago…I still begin with a title and a brief statement of theme. Then, on the backs of old envelopes, come structural notations having to do with overall form and texture of the work, lists of characters, bits of background data, suggested sequences of chapters. I usually have the beginning and the end of any story fairly clear before I start; the middle is subject to development once the story acquires life of its own, and so I constantly write memoranda to myself as I go along…Choices I once made automatically and unconsciously I must now work out on paper, and there seems no way around it…There are times when I miss the old ease of production, but I do prefer today’s results.